Understanding gases dissolved in magma is critical in understanding why volcanoes erupt. Bodies of magma rise in the crust until they reach a point of neutral buoyancy. The expansion of gases brings the magma closer to the surface and drives eruptions. The interaction between the viscosity and temperature of the magma and the gas content determines if an eruption will be effusive or explosive. On a global scale, volcanic gases produced our atmosphere and our oceans. Without the atmosphere and oceans, life would not have evolved on Earth. Gases emitted by volcanoes continue to influence the atmosphere but not to the extent of man-made sources. Gases also pose a hazard at many volcanoes. At other volcanoes, the gradual release of gas acts as an irritant and may pose a long-term health hazard. Right: gas sampling at vents on the floor of Halemaumau Crater, Kilauea volcano, Hawaii. Photo by Steve Mattox. Water vapor (H2O), carbon dioxide (CO2), and sulfur dioxide (SO2) are the most common volcanic gases. In lesser amounts, volcanoes release carbon monoxide (CO), hydrogen sulfide (H2S), carbonyl sulfide (COS), carbon disulfide (CS2), hydrogen chloride (HCl), hydrogen (H2), methane (CH4), hydrogen flouride (HF), boron, hydrogen bromine (HBr), mercury (Hg) vapor, organic compounds, even gold. From Cadle (1980). Mercury is released by most volcanoes and has been measured at Kilauea, Mauna Loa, Hekla, Erebus, at Mount St. Helens (Siegel and Siegel, 1987). Kilauea produces about 270 tons of mercury each year and has been identified as the source for mercury on Oahu, 320 km away. Cu, K, Na, Sb, Ni, Ga, V, Fe, Mn, and Li at concentrations 100 to 1 that in the magma. Gold has condensed from volcanic gases. Meeker and others (1991) reported gold at Mount Erebus, Antarctica. They found gold in the plume near the crater , in the air up to 1000 km from the volcano and in near surface samples. Most of these gases originate in the mantle and are transported to the crust and surface by complex interactions with magma and rocks encountered along the way. In general, the gases are dissolved in the magma. At shallow depths, as pressure on the magma decreases, the gases leave the magma (exsolve). The gases can interact with surrounding rocks or continue to the surface. Inset Image: Sulfur deposits near the summit of Griggs volcano, Alaska. Based on elemental compositions, convergent-plate volcanoes tend to have higher H (reflected in H2O) and lower C and S (CO2 and SO2) relative to divergent-plate volcanoes and hot-spot volcanoes (which have high relative C and S and low H). HCl is higher at Etna and does not fit the pattern, perhaps because of its alkaline magma composition. Plate tectonics influences these abundances. The subducted slab contributes H2O and Cl to convergent-plate magmas. Magma sources for divergent-plate volcanoes and hot-spot volcanoes are located in the mantle and have moderate amounts of C and S and are relatively depleted in H2O and HCl. Giggenbach, W.F., and LeGuern, Francois, 1976, The chemistry of magmatic gases from Erta Ale, Ethiopia: Geochimica et Cosmochimica Acta, v. 40, p. 25-30. Symonds, Rose, Bluth, and Gerlach, 1994, Volcanic-gas studies: Methods, results, and applications in Carroll, M.R., and Holloway, J.R., editors, 1994, Volatiles in magmas: Mineralogical Society of America, Reviews in Mineralogy, v. 30, 517 p.
Scientists can determine the amount and types of gas in a rock, in the minerals within a rock, or in the gas inclusions in minerals or glass (Ihinger and others, 1994). The methods fall into four classes: bulk extraction, energetic particle bombardment, vibrational spectroscopic techniques, and phase equilibrium studies. These method are used in experimental studies and for rocks from all tectonic settings, historic eruptions, and large pre-historic eruptions. Some methods have been found to underestimate the observed amount of gas released during some historic eruption. Thus, the methods may give an estimate of the minimum amount of gas released. For example, Gerlach and McGee (1994) used melt inclusion data to estimate 0.08 Mt of SO2 emitted by the Mount St. Helens eruption. TOMS, COSPEC and ash leachate data provide an estimate of 2 Mt. Gerlach and McGee suggested a vapor phase carried most of the SO2. The easiest, but often the most difficult, way to collect a sample is by hand, placing a container directly in the gases. This method was perfected by the late Werner Giggenbach. Difficulty arises because of the high temperatures, dangers associated with being close to vents, and the possibility of contamination of the sample by the atmosphere. Left diagram: Evacuated-bottle sampling scheme. Direct samples are most commonly collected in solution-filled bottles (4N NaOH in a titanium or silica tube) and then returned to the lab for analyses. In the drawing on the left, the enlargement shows an evacuated glass bottle. The solution contains NaOH and collected H20), H2S, SO2, HCl, HF, and CO2. The headspace contains collected H20, H2, CH4, O2, CO, N2, Ar, Ne. Right diagram: Flow-through sampling scheme. Figure from Sutton and others, 1992). Right: Volcanic gases from Kilauea collected using the flow-through sampling scheme. Photo by Steve Mattox. Another way to measure gases released by a volcano is to collect fresh ash samples (before it rains) and pour distilled water through the ash. Then after the liquid passes through the ash it is collected. This is the leachate. The leachate is analyzed for Cl (chloride), F, SO4 and pH. The ratio of Cl to S increases prior to eruptions. Leachates were measured prior to the 1980 eruption at Mount St. Helens (Nehring and Johnston, 1981). Cl and SO4 were measured in the field and the S/Cl ratio was observed to increase gradually from March 28 to May 18. The S/Cl ratio increased 30 times over its initial value prior to an eruption of Asama volcano in Japan. At Fuego, in Guatemala, the S/Cl ratio increased 5 times over its initial value and the size of the change was proportional to eruption size. Continuous direct sampling is a relatively new method to monitor gases. Results of measurements are telemetered to safe locations off the volcano. At Mount St. Helens, upward-moving fresh magma was detected 12 to 60 hours before it was extruded into the dome (McKee and Sutton, 1994). Volcanologist found an application for an instrument used to measure pollution. A correlation spectrometer (COSPEC) is designed to measure the amount of sulfur dioxide in a passing air mass (or volcanic plume). The spectrometer compares the amount of solar ultraviolet light absorbed by sulfur dioxide in the plume to an internal standard. Numerous measurements are made to achieve reliable results. COSPEC used to measure SO2 released by Merapi Volcano. Use of vehicle-mounted (left) and tripod-mounted (right) ground-based COSPEC. A. Side view. B. Front view. C. Typical data. From Sutton and others (1992). Balloons are used to take samples in or to carry instruments into aerosol layers. For example, Sheridan and others (1992) collected samples of atmospheric particles from the Pinatubo eruption by releasing balloons from Laramie, Wyoming. Most of the fine particles were H2SO4 droplets. Other larger particles were supermicrometer sulfate particles and composite sulfate/crustal particles. Deshler and others (1992) also used balloons to study the aerosols in the Pinatubo layer. Their study showed that 90% of the SO2 had been converted to H2SO4 aerosol within one month of the eruption. They also measured pressure, temperature, ozone, and particle density. LIDAR is a ground-based remote sensing method that is used to measure the distribution and amounts of several gases in the atmosphere. NOAA has a fine page that explains LIDAR data. TOMS image of the Mt. Pinatubo SO2 plume two days after the June 15th eruption The red dot marks the location of the volcano. The concentration of sulfur dioxide is expressed in units of milli-atmosphere centimeters, which gives the total column abundance in the atmospheric column Image created by Gregg Bluth and Arlin Krueger, NASA Goddard Space Flight Center. The Total Ozone Mapping Spectrometer(TOMS) is used for high resolution mapping and measurements of the ozone layer. TOMS also detects volcanic eruptions and measures the amount of sulfur dioxide released. TOMS was used to measure the sulfur dioxide clouds from three explosive eruptions of the Crater Peak vent of Mount Spurr during the Summer of 1992. The Advanced Very High Resolution Radiometer (AVHRR) is used to track the aerosol layer produced by eruptions. For example, during the Pinatubo eruption, AVHRR showed that the layer circled the Earth in 21 days and that it had inhomogeneities that persisted for more than two months. The layer covered 42% of the Earth after only two months, over twice the area of El Chichon in the same amount of time. Data gathered allowed an estimate of the net global cooling effect of 0.5 degree C for a period of 2-4 years after the eruption (Stowe and others, 1992). Maps show thickness of aerosol optical products prior to and 20 days after the 1991 eruption of Pinatubo. Photo credit: G.J., Orme, Department of the Army. Understanding volcanic gases is essential to understanding how and why volcanoes erupt. First, it is important to realize that gases can be both dissolved in a magma chamber at depth and can be emitted from volcanoes at the surface. It is dissolved gases that cause volcanoes to erupt and it is gases emitted at the surface that can cause hazards and changes in climate. A magma chamber at high pressures below the surface contains dissolved gases or volatiles. The density contrast between the magma and the surrounding rock, will allow the more buoyant magma to rise to the surface. As the magma ascends, dissolved gases come out of the liquid, or exsolve as tiny bubbles. Bubbles will grow and increase in volume, making the magma more buoyant and able to ascend even closer to the surface. As the magma travels upward, the overlying pressure decreases and the bubbles will expand and create a magmatic foam. It is not until the pressure in the bubbles becomes greater than the pressure of the overlying rock that the chamber will burst and produce a volcanic eruption . The viscosity , temperature and composition of the magma will determine whether the eruption is explosive or effusive. If the rapidly expanding gas bubbles remain in contact with the liquid and cause the magma to fragment into volcanic rock, an explosive eruption will occur, like the 1980 eruption of Mount St. Helens. If the bubbles can rise through the liquid and escape, then the eruption will be more effusive and generate lava flows like those we see in Hawai’i. It is the expansion of gases as they rise to the surface that drives volcanic eruptions. The image to the right, from Oleg Melnik, shows a magma chamber at depth with dissolved volatiles. As the magma rises, the bubbles come out of solution producing vesiculated magma. The magma fragments into volcanic rock at the fragmentation level. Gas-particle dispersion occurs at the top of the conduit just below the surface and pyroclasts erupt onto the surface during a volcanic eruption. On a global scale, volcanic gases actually created the atmosphere and oceans that enable life to exist here on Earth. Once a volcano erupts, gases are emitted and released into the atmosphere. During large eruptions, gases have actually caused global climate change. In other systems, gases are emitted continuously into the atmosphere from soils, volcanic vents, fumaroles and hydrothermal deposits. The gradual release of gas acts as an irritant and may pose long-term health-hazards. It is therefore important to monitor gases emitted from active volcanoes not only because they can pose very serious health risks and cause climate change but also because they are indicators of what is happening inside the volcano. The most abundant gas is water vapor (H2O), followed by carbon dioxide (CO2), and sulfur dioxide (SO2). Secondary gases are also commonly emitted from volcanoes and include hydrogen sulfide (H2S), hydrogen (H), carbon monoxide (CO), hydrogen chloride (HCl), hydrogen fluoride (HF), and helium (He). The greatest potential hazards to humans, animals and agriculture are SO2, CO2 and HF. Symonds, R.B., Rose, w.I., Bluth, G., and Gerlach, T.M., 1994, Volcanic gas studies: methods, results, and applications, in Carroll, M.R., and Holloway, J.R., eds., Volatiles in Magmas: Mineralogical Society of America Reviews in Mineralogy, v. 30, p. 1-66. Because volatiles play an important role in the generation, evolution and eruption of magma , it is critical that we use various tools to monitor gases both within and emitted from a volcano . Advanced analytical techniques have been employed for measuring dissolved volatiles in volcanic rocks and in remote sensing technology used for analyzing volcanic emissions. These advancements have led to our most recent understanding of volatiles fluxes from volcanic eruptions. Pre-eruptive dissolved volatile contents can be measured directly through the study of melt inclusions (MI) and fluid inclusions (FI). A melt inclusion is defined as containing glass or crystallized glass. A fluid inclusion contains no glass but rather one or more fluids at room temperature. Because gases exsolve or come out of the liquid during eruption , the tephra erupted on the surface reveals little information on the original volatile content that existed in the magma chamber at depth. The tools that we use to measure preeruptive volatile contents directly include Fourier Transform Infrared spectrometry (FTIR) and Secondary Ion Mass spectrometry (SIMS). Five naturally glassy, bubble-free MI of various sizes from Plinian fallout deposit of the Tara Ignimbrite , Chile. Image is 700 microns. Phenocrysts often trap small (1-300mm) fractions of silicate melt at magmatic temperatures and pressures during crystallization. Melt inclusions, incorporated into relatively incompressible phenocryst hosts like quartz, are able to retain the pre-eruptive volatile signature of the melt during eruption. This makes melt inclusions very useful tools in determining dissolved volatile concentrations directly. Through analytical techniques of the quenched inclusions, we can quantify the pre-eruptive concentrations of volatile gases such as H2O, CO2, S and Cl. Melt inclusion analyses can also provide a history of the evolution of a particular magmatic system. Fluid inclusions are small droplets (<1mm) of fluid that like melt inclusions, are trapped within a phenocryst host. They are primarily two-phase, consisting of a liquid and a gas or vapor bubble. Fluid inclusions are remnant samples of very recent to ancient fluids that existed within the magmatic system. Studies of fluid inclusions allowed geologists to reconstruct the past history of the host rocks within which they are found. Thanks to several decades of strong efforts to improve analytical techniques, we can now identify and analyze the volatile content of these tiny inclusions. MI data can faithfully record magmatic processes, which other petrological tools could not reveal. We have discovered that H2O and CO2 are the most abundant volatiles in most silicate magmas and that they play a major role in controlling the rheological properties of magmas, including the viscosity and density. comes from analyses of micrometer-sized features! de Vivo, B. A. Lima, & J. D. Webster, Volatile in Magmatic-Volcanic Systems, Elements, 1, 19-24. King P. L., T. W. Vennemann, J. R. Holloway, R. L. Hervig, J. B. Lowenstern, and J. F. Forneris, Analytical techniques for volatiles: A case study using intermediate (andesitic) glasses, American Mineralogist, 87, 2002. Lowenstern, 1995. Melt Inclusions Come of Age: Volatiles, Volcanoes, and Sorby’s Legacy. Lowenstern, J.B.(1995) Applications of silicate melt inclusions to the study of magmatic volatiles. In: Thompson, J.F.H. (ed.) Magmas, Fluid and Ore Deposits. Mineralogical Association of Canada Short Course 23, 71-99. How much gas is emitted from a volcano during a certain time period is directly related to the volume of magma that sits in the subsurface reservoir. Measuring the rate at which a volcano releases gas or degasses, typically reported in metric tons per days, allows scientists to get a glimpse of what is happening below the surface. Changes in gases like sulfur dioxide and carbon dioxide are important to monitor in active volcanic systems since they can be indicative of activity occurring in the volcano’s magma reservoir and hydrothermal system. Emission rates can be measured either from the ground or from an aircraft. Gas ejected high into the atmosphere during a volcanic eruption requires satellites to measure the emitted gas. The easiest, but perhaps the most dangerous way to collect a gas sample is by hand, placing a container directly in the gases. This technique is used to produce a detailed chemical analysis of a specific fumarole or vent , where a scientist can actually insert a tube into a hot opening. This method is ideal for long term study of volcanoes rather than for monitoring rapidly changing conditions. The technique requires days to weeks of laboratory analysis following sampling in order to get data. Direct sampling requires a scientist to insert a chemically inert and heat resistant tube into a hot opening like a fumarole or vent. It takes about 5 minutes for the tube to heat up to a point where any condensation within the tube has reached equilibrium with the escaping gases. Then, either by attaching an evacuated-sample bottle or a flow-through sample bottle to the collection tube, the gases will be gathered for analysis. The evacuated-bottle method is shown in the image to the right. The device includes a glass bottle with a sample port and a high vacuum-stopcock. Before arriving at the collection site, the bottle must be partially filled with concentrated aqueous sodium hydroxide (NaOH) that has been carefully weighted and evacuated with a vacuum pump. Once the tube is inserted into the fumarole or vent, the gases will bubble through the solution and gases like CO2, H2S, SO2, HCL and HF will dissolve into the liquid. Those gases that remain like N2, O2, H2, CO and He will rise further and collect in the headspace of the bottle. This technique involves collecting the gases at the site where the gases are being emitted and then returning to the laboratory for analysis. This method is used because of its good analytical precision that stems from its ability to concentrate the gases in the solution and the headspace. Those gases that rise into the headspace are analyzed by gas chromatography. Those that dissolve into the liquid are analyzed by ion chromatography or traditional wet-chemical techniques. The flow-through bottle method is shown in this image to the left. The device includes a glass bottle but with a stopcock at each end and a hand-operated pump attached to the sampling tube. The purpose of the hand pump is to flush out the air while entraining the gases into the bottle. This method is not as precise as the evacuated-bottle method, but is utilized in situations where sampling must be done rapidly due to hazardous environments and conditions. A detailed analysis has that advantage that it can provide the information necessary to reconstruct the conditions of the magma at depth, which is the source region for the emitted gases. Sutton, A.J., McGee, K.A., Casadevall, T.J., and Stokes, B.J., 1992, Fundamental volcanic-gas-study techniques: an integrated approach to monitoring: in Ewert, J.W., and Swanson, D.A. (eds. ), 1992, Monitoring volcanoes: techniques and strategies used by the staff of the Cascades Volcano Observatory, 1980-90: U.S. Geological Survey Bulletin 1966, p. 181-188. A correlation spectrometer or COSPEC was initially designed to measure industrial pollutants and now has been applied to the field of volcanology to measure volcanic gas emissions. The spectrometer is designed to measure the concentration of sulfur dioxide (SO2) in the volcanic plume that is emitted from the volcano. The device requires a standard, from which to analyze the ultraviolet light absorbed by the SO2 molecules in the plume. Multiple measurements are made to acquire reliable results. This COSPEC is used either from the ground where it is mounted on a vehicle or tripod that scans the plume, or the device can be attached to an aircraft that traverses underneath the plume. The best quality measurements are obtained when an aircraft flies at right angles to the direction of plume travel acquiring data with each flight. These images show various ways that a COSPEC can be set up-on a tripod, in a vehicle or on an aircraft. Average daily SO2 emission rates from Mount St. Helens from 1980-1988. COSPEC data were retrieved using a COSPEC mounted on an aircraft. For data, see Open-File Report 94-212. An infrared carbon dioxide analyzer or Li-COR has become a standard method for measuring carbon dioxide (CO2) emission rates. It is employed in a similar manner to the COSPEC but requires data from the whole plume in order to calculate a carbon dioxide emission rate. The aircraft that hosts the device flies systematically through the plume creating a cross-section analysis of the gas emissions at different elevations. This photo to the right is taken while flying under the volcanic plume to measure SO2- photo from USGS. The LI-COR can also be used to measure soil efflux emissions. These soil emissions are typically in areas where volcanic gases rise from depth and remain in the soil directly beneath the surface. To measure the rate of gas emissions into the atmosphere, a accumulation chamber is set up on the soil surface and connected to a LI-COR instrument. The gas enters the chamber and is measured for increasing CO2 concentrations. A soil efflux for that specific location is calculated based on other parameters that include, pressure, temperature. Additional efflux values at various locations must be measured to acquire reliable measurements that are representative of a volcanic system, from which a map can be constructed showing the elevated soil CO2 values. Gerlach, T.M., Doukas, M.P., McGee, K.A., and Kessler, R., 2001, Soil efflux and total emission rates of magmatic CO2 at the Horseshoe Lake tree kill, Mammoth Mountain, California, 1995-1999: Chemical Geology, v. 177, Issues 1-2, pgs. 101-116. The FTIR or Fourier Transform Infrared Spectrometer can be used to measure dissolved volatile concentrations as described above or can be used to measure several gases emitted from a volcano simultaneously. The device can be used both as an open-path or closed-path system. The open-path system aims the FTIR at a plume using an optical telescope. The closed-path system delivers gas from a plume or fumarole to a gas cell within the FTIR. Continuous volcano monitoring stations can be used to gauge both short-lived degassing episodes that happen within minutes to hours as well as long-lived activity that happens over days to years. With advancing technology, scientists are able to set up a station to monitor gases from fumaroles, vents, soils, hydrothermal deposits, etc and transmit the data directly to an online directory or observation location. To monitor the activity at the Pu `u `O `o vent on the Big Island of Hawai’i, the Hawaiian Volcano Observatory (HVO) set up a monitoring station on the flanks of Kilauea’s east rift zone . Gas emissions as well as the wind speed and wind direction are periodically sampled and get transmitted every 10 minutes to HVO. This allows HVO to monitor degassing at the active vent almost instantaneously. The SO2 converts to sulfuric acid aerosols that block incoming solar radiation and contribute to ozone destruction. The blocked solar radiation can cause global cooling. The amount of SO2 released by volcanoes is much less compared to man-made sources but the impact of some eruptions might be disproportionately large. The gases emitted by most eruptions and by man-made sources never leave the troposphere, the layer in the atmosphere from the surface to about 10 km. However, volcanic gases reach the stratosphere, a layer in the atmosphere from about 10 km to about 50 km in altitude, during large eruptions. This relationship is complicated by the fact that the elevation between the volcano summit and the distance to the troposphere/stratosphere decreases with latitude. So, some smaller eruptions at higher latitudes can eject as much SO2 gas into the stratosphere as larger eruptions closer to the equator. Factors influencing the amounts of SO2 in the stratosphere were described and modeled by Bluth and others (1997). For eruptions in the last 25 years, El Chichon and Mount Pinatubo emitted the greatest amounts of SO2 into the stratosphere. El Chichon produced 7 Mt of SO2 and Mount Pinatubo produced 20 Mt. Both of these volcanoes are at low latitudes but they both had high eruption rates. The importance of latitude is obvious for four of the next five volcanoes that had a major influence on SO2 amounts in the stratosphere. Hudson, St. Helens, Alaid, and Redoubt are all at latitudes greater than 45 degrees, where the distance to the stratosphere is less. The eruption rate of Hudson was comparable to El Chichon and Mount Pinatubo. However, the eruption rates of St. Helens, Alaid, and Redoubt where an order of magnitude less. These volcanoes emitted 1, 1.1, and 0.2 Mt of SO2. The other eruption was at Ruiz, which had a high eruption rate, comparable to El Chichon and Mount Pinatubo, but is near the equator. Ruiz emitted 0.7 Mt of SO2. Bluth and others (1997) used the changes in aerosol optical depth as a measure of the impact of the eruptions. The impact of eruptions may not last very long. The aerosols in the stratosphere from mid-range eruptions (St. Helens, Alaid) settled back to the troposphere in about 5-8 months (Kent and McCormick, 1984). For large eruptions like El Chichon it takes about 12 months for SO2 levels in the stratosphere to return to pre-eruption levels. Pinto and others (1989) suggested that at high eruption rates aerosols tend to make larger particles, not greater numbers of same size aerosol particles. Larger particles have smaller optical depth per unit mass, relative to smaller particles, and settle out of the stratosphere faster. These self-limiting effects may restrict the total number of particles in the stratosphere and may moderate the impact of volcanic clouds (Rampino and Self, 1982; Pinto and others,1989). More complicated patterns of warming and cooling have been found on regional scales. Robock and Mao (1992) found warming over Eurasia and North America and cooling over the Middle East and northern Africa during the winters after the 12 largest volcanic eruptions from 1883-1992. For eruptions in the tropics the temperature changes were noted in the first winter after the eruption. For eruptions in the mid-latitudes changes were observed in the first or second winter after the eruption. For eruptions in high latitudes changes were observed in the second winter after the eruption. Robock and Mao (1992) proposed that heating of the tropical stratosphere by the volcanic aerosols led to an enhanced zonal winds. The zonal winds heated some areas while blocking of solar radiation cooled other areas. The 1982 eruption of El Chichón produced one of the largest sulfuric acid plumes this century. The eruption was immediately followed by an El Niño event in 1982-83, the largest El Niño of the century up to that time. Roback and others (1995) used three different models to see if the eruption volcanic eruptions might trigger or enhance the El Niño. One model, involving mid-tropospheric heating, did result in a weakening of the trade winds. This change was consistent with observed surface winds north of the Equator in the eastern Pacific Ocean. However, Roback and others (1995) noted that the 1982 El Niño event had started before this wind anomaly. Furthermore, they pointed out that only trade wind collapses in the western equatorial Pacific can initiate El Niños. They concluded that the El Chichón eruption and the large El Niño event were a coincidence. Handler (1984) looked at all VEI = 4 or more historic eruptions to see if they were associated with El Nino events. He sorted the volcanoes by latitude. Low latitude (20 N to 20 S) eruptions are associated with an increase in sea surface temperatures in the eastern tropical Pacific Ocean (see above figure), the area where El Nino events begin. The warmer temperatures last up to three seasons after the eruptions. Handler called for further theoretical work on these observations. Ozone is a gas made of three oxygen atoms. Ozone is bluish in color and harmful to breathe. Most of the Earth's ozone (about 90%) is in the stratosphere. The stratosphere is a layer in the atmosphere from about 10km to about 50km in altitude. Ozone is important because it absorbs specific wavelengths of ultraviolet radiation that are particularly harmful to living organisms. The ozone layer prevents most of this harmful radiation from reaching the ground. As concern grew over depletion of ozone in the stratosphere scientists examined the role of volcanoes. They noted that the gases emitted by most eruptions never leave the troposphere, the layer in the atmosphere from the surface to about 10km. Hydrogen chloride released by volcanoes can cause drastic reductions in ozone if concentrations reach high levels (about 15-20 ppb by volume)(Prather and others, 1984). As the El Chichon eruption cloud was spreading, the amount of HCl in the cloud increased by 40% (Mankin and Coffey, 1984). This increase represents about 10% of the global inventory of HCl in the stratosphere. Other large eruptions (Tambora, Krakatau, and Agung) may have released almost ten-times more HCl into the stratosphere than the amount of chlorine commonly present in the stratosphere (Pinto and others, 1989). At least two factors reduce the impact of HCl, chlorine appears to be preferentially released during low-levels of volcanic activity and thus may be limited to the troposphere, where it can be scrubbed by rain. Hydrogen chloride may also condense in the rising volcanic plume, again to be scrubbed out by rain or ice. Lack of HCl in ice cores with high amounts of H2SO4 (from large eruptions) may indicate ambient stratospheric conditions are extremely efficient at removing HCl. Thus, most HCl never has the opportunity to react with ozone. No increase in stratospheric chlorine was observed during the 1991 eruption of Mt. Pinatubo. Volcanoes account for about 3% of chlorine in the stratosphere. Methyl chloride produces about 15% of the chlorine entering the stratosphere. The remaining 82% of stratospheric chlorine comes from man-made sources, mostly in the form of chlorofluorocarbons. Although volcanic gases do not play a direct role in destroying ozone they may play a harmful indirect role. Scientists have found that particles, or aerosols, produced by major volcanic eruptions accelerate ozone destruction. The particles themselves do not directly destroy ozone but they do provide a surface upon which chemical reactions can take place. This enhances chlorine-driven ozone depletion. Fortunately, the effects from volcanoes are short lived and after two or three years, the volcanic particles settle out of the atmosphere. Study of ozone amounts before and after the 1991 eruption of Mt. Pinatubo show that there were significant decreases in lower stratospheric ozone (Grant and others, 1994). The amount of ozone in the 16-28 km region was some reduced by 33% compared to pre-eruption amounts. A similar reduced amount of ozone was measured in the summer of 1992. Do humans add more gases to the atmosphere or do volcanoes? It's a simple question with a complicated answer. Reaching a good estimate is important in guiding global policy for standards to reduce emissions from man-made sources of gases. Present-day carbon dioxide (CO2) emissions from subaerial and submarine volcanoes are uncertain at the present time. Gerlach (1991) estimated a total global release of 3-4 x 10E12 mol/yr from volcanoes. While this is a conservative estimate, man-made (anthropogenic) CO2 emissions overwhelm this estimate by at least 150 times. Andres and Kasgnoc (1997) estimated the time-averaged inventory of subaerial volcanic sulfur emissions. There inventory was based upon the 25 year history of making sulfur measurements, primarily sulfur dioxide (SO2), at volcanoes. Actual measurements of subaerial volcanic sulfur dioxide emissions indicate a time-averaged flux of 13 Tg/yr sulfur dioxide from early 1970 to 1997. [Note: a Tg is equal to 10E12 grams]. About 4 Tg come from explosive eruptions and 9 Tg is released by passivedegassing, in an average year. When considering the other sulfur species also present in volcanic emissions, a time-averaged inventory of subaerial volcanic sulfur emissions is 10.4 Tg/yr sulfur. Volcanoes and other natural processes release approximately 24 Tg of sulfur to the atmosphere each year. Thus, volcanoes are responsible for 43% of the total natural S flux each year. Man's activities add about 79 Tg sulfur to the atmosphere each year. In an average year, volcanoes release only 13% of the sulfur added to the atmosphere compared to anthropogenic sources. Andres and Kasgnoc (1997) noted that the bulk of the anthropogenic flux is located in the northern hemisphere while volcanic fluxes occur in much more focused belts around the world. Gases from Kilauea provides a comparison of a man-made sulfur dioxide gas leaked at a refinery to the gas released by a volcano. Data compiled by Cadle (1980). Most of the gases emitted by the ocean return to the oceans. Volcanoes also release heavy metal elements as particulate matter. Buat-Menard and Arnold (1978) looked at heavy metals released by Etna. Compared to anthropogenic (man-made) sources, the amount of lead released by Etna is insignificant, the amounts of cadmium, mercury, copper, and zinc are comparable; and the amount of selenium is greater than other sources in the Mediterranean atmospheric environment. Andreae M.O., 1990, Ocean-atmosphere interaction in the global biogeochemical sulfur cycle: Marine Chemistry, v. 30: 1-29. Andres, R.J., and Kasgnoc, A.D., Global Emissions Inventory Activity, 1997, Global Emissions Inventory Activity: Time-Averaged Inventory of Volcanic Sulfur Emissions. Barnes, Ivan, Irwin, W.P., and White, D.E., 1978, Global distribution of carbon dioxide discrages, and major zones of seismicity: U.S. Geological Survey Water Resources Investigation 78-79, Open-File Report, 12 p.
Bates, T.S., Lamb, B.K., Guenther, A., Dignon, J., Stoiber, R.E., 1992, Sulfur emissions to the atmosphere from natural sources. Journal of Atmospheric Chemistry 14:315-337. Buat-Menard, P., and Arnold, M., 1978, The heavy metal chemistry of atmospheric particulate matter emitted by Mount Etna volcano: Geophysical Research Letters, v. 5, p. 245. Cadle, R.D., 1980, A comparison of volcanic with other fluxes of atmospheric trace gas constituents: Reviews of Geophysics and Space Physics, v. 18, p. 746-752. Tamar Elias, written communication, , 28 May 1997. Gerlach, T.M., 1991, Present-day CO2 emissions from volcanoes: Transactions of the American Geophysical Union (EOS), v. 72, p. 249, and 254-255. Gerlach, T.M., 1991, Etna's Greenhouse Pump: Nature, 351, p. 352-353. At certain concentrations some volcanic gases can be fatal. In historic time, deaths have been caused by sulfur dioxide, carbon dioxide, and carbonic acid and hydrogen sulfide. The following information is compiled from Volcanoes of the World by Simkin and Siebert (1994), and the Bulletin of the Global Volcanism Program. Right: Photo of dead buffalo at Lake Nyos, Cameroon. Jack Lockwood, U.S. Geological Survey. In 1794, an eruption at Vesuvius killed about 400 people. Several people died from carbon dioxide. In 1872, an unknown number of fatalities were caused by carbon dioxide. Seven people died of gas inhalation in 1873. The 1650 eruption of Etna caused about 40 deaths; some caused by opthalmias from sulfurous vapors and suffocation. The crew of a ship suffocated as it passed the volcano. In August, 1984, 37 people were killed when carbon dioxide was released from Lake Monoun. In August, 1986, 1,700 people were killed when a large amount of carbon dioxide was released from Lake Nyos. At least 300 people were hospitalized. Karthala is a shield volcano with 30 historic eruptions. In 1903, 17 people died from suffocating gases. They were near solfataras at 1,600 m.
In June of 1990, three people died of suffocation at Rabaul in a vent of the east side of Tavurvur. Three more people died trying to retrieve the bodies. Tangkubanparahu is a stratovolcano with at least 16 historic eruptions. In June of 1923, three boys were killed by asphyxiating gas. Carbonic acid and hydrogen sulfide were involved. The volcano was not erupting. Papandayan is a stratovolcano with three historic eruptions. In December of 1924, a volcanological observer died, probably by suffocation due to hydrogen sulfide. The Dieng Plateau, a complex volcano, has had at least 16 historic eruptions. In February of 1979, at least 149 people died from poisonous gas(es) (either crbon dioxide or carbon dioxide and hydrogen sulfide) as they fled eruptions at Sinila and Sigludung Craters. Hakone, a complex volcano, has not erupted in 1,000 years. In May of 1933, one person was killed in association with fumarolic activity. The Tseax River Cone, a pyroclastic cone, erupted in 1325 and 1730 AD. During the 1730 eruption lava overran a village. Several people dug pits for shelter but died due to "poison smoke." Santa Maria is a stratovolcano. In October of 1902, an eruption killed about 1,500 people. At least 350 people in one village died from deadly fumes. Los Carran Venados has had three historic eruptions: Rininahue maar in 1907, Carran maar in 1955, and Mirador in 1979. Two people were killed by gases during the 1955 eruption. During the 1973 eruption near Vestmannaeyjar a sleeping man was killed by carbon dioxide as it pooled in the basement of his house. La Palma is a stratovolcano with seven historic eruptions. Two eruptions caused fatalities. In 1677, one man and many animals were killed by gas. Volcanic gases in Hawaii are not fatal but vog (volcanic smog) may degrade lung function and compromise peoples immune systems, especially in children, individuals with chronic asthma or other respiratory impairments, or people with circulatory problems. Left: Mt. Pinatubo eruption plume, July 1991, from Clark Air Base control tower. Photo by J.N. Marso, U.S. Geological Survey. 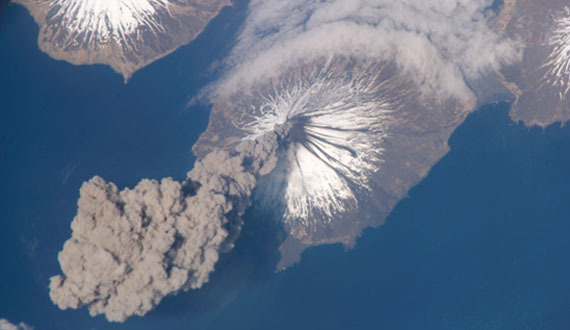 The effects of several historic eruptions have been observed and the impacts of larger, prehistoric eruptions can be estimated. Estimates of the fraction of sunlight transmitted through stratigraphic aerosols after major eruptions. Roza refers to a flood basalt eruption in the northwestern United States. Graph from Rampino and others (1988). Impact of some major historic eruptions. Data from Rampino and Self, 1984. Photo by R.S. Culbreth, U.S. Air Force. Mt. Pinatubo eruption of June 12, 1991. Height of ash cloud about 12 miles (20 km). The volume of the Mt. Pinatubo eruption was about 5 cubic km of dacite . It was the third largest eruption of this century. It produced the greatest volume of SO2 ever measured, 20 Mt, about three times more than El Chichon (McCormick, 1992). This gas reached the stratosphere and circled the globe in three weeks (Bluth and others, 1992). SAGE II map of the distribution of stratospheric aerosols from the Pinatubo eruption between June 14 and July 26, 1991 (i.e., the period of the major eruptions). Note the nearly two orders of magnitude increase in the optical depth in the tropics. Image by Pat McCormick, Langley Research Center. Slides from EOS Slide Set #1. Most of the early aerosol was limited to tropical latitudes of 30 degrees N to 20 degrees S. Temperatures in the stratosphere increased as much as 3.5 degrees C at some latitudes (Labitzke and McCormick, 1992). It is estimated that the gases caused a global temperature decrease of 0.5 degree C for about 2 to 4 years after the eruption. El Chichon was the first major eruption to have its atmospheric effects studied in detailed by modern instruments. Although the volume of the eruption was small (< 1 cubic km of alkalic trachyandesite tephra , similar in volume to Mount St. Helens), El Chichon was also notable because it released an unusually large volume of aerosols (7 Mt of SO2 compared to 1.0 for Mount St. Helens). The ash contained up to 2 weight percent sulfate. Anhydrite (made of CaSO4) crystals were also in the deposits. Anhydrite is rare in volcanic rocks. El Chichon had three Plinian eruptions, each sending gas and dust to the stratosphere. The eruption cloud was carried west, reaching the Philippines in 10 days and circling the globe at returning to Mexico in 20 days. Atmospheric circulation cells kept the cloud at about 30 degrees north latitude for more than six months after the eruption. All of the gaseous SO2 ejected into the stratosphere had been converted to sulfuric acid aerosol within six months. Balloon measurements discovered that a month after the eruption 20 million tonnes of sulfuric acid remained in the atmosphere. After one year, less than 8 million tonnes remained. El Chichon produced some climate effects. The temperature of the stratosphere increased by 4 degrees C. This was caused by the absorption of some of the incoming solar radiation. This was the greatest increase since measurements began in 1958. Impact on ground temperatures is harder to quantify but temperatures in the Northern hemisphere may have been 0.2 degree C less about 2 months after the eruption. Krakatau erupted more than 10 cubic km of magma releasing 30-38 Tg of stratospheric aerosol in the Southern Hemisphere and 55 Tg of stratospheric aerosol in the Northern Hemisphere. Although Krakatau erupted a large volume, the magma was relative poor in sulfur, and the eruption had less climate impact compared to some small volume eruptions that were sulfur rich (e.g., Agung in Indonesia). The abundance of sulfur in a magma is inversely proportional to silica content. The basaltic andesite magma of Agung contained more sulfur than the higher silica magma of Krakatau. Rampino and Self (1982) estimated that the temperature in the Northern Hemisphere decreased 0.3 C due to the eruption. Drawing of the ash cloud from the 1883 eruption. 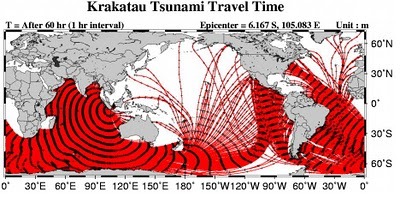 Photo credit: National Geophysical Data Center (P. Hedervari). The Laki eruption lasted eight months during which time about 14 cubic km of basaltic lava and some tephra were erupted. Haze from the eruption was reported from Iceland to Syria. In Iceland, the haze lead to the loss of most of the island's livestock (by eating fluorine contaminated grass), crop failure (by acid rain), and the death of one-quarter of the human residents (by famine). Ben Franklin noted the atmospheric effects of the eruption (Wood, 1992). Photo of main fissure at Laki by Thor Thordarson. 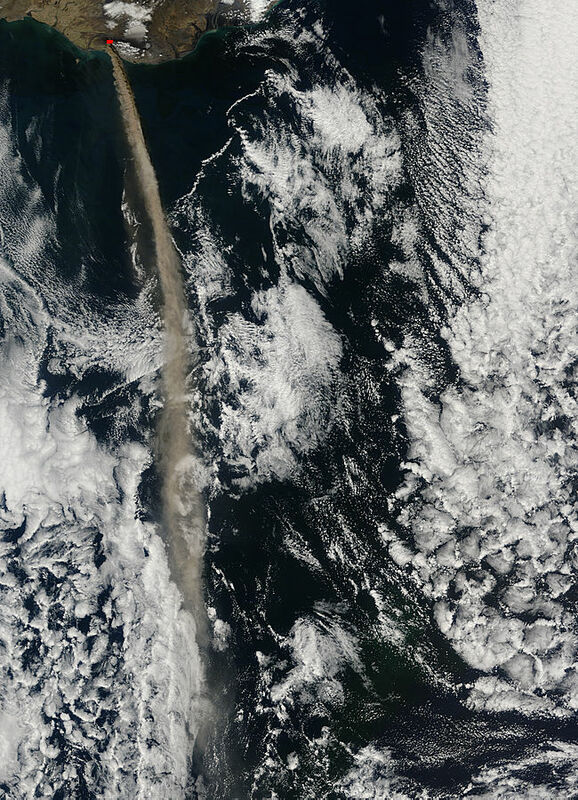 It is estimated that 80 Mt of sulfuric acid aerosol was released by the eruption (4 times more than El Chichon and 80 times more than Mount St. Helens). The climatic effects of the Laki eruption are impressive. In the eastern United States, the winter average temperature was 4.8 degrees C below the 225 year average. The estimate for the temperature decrease of the entire Northern Hemisphere is about 1 degree C. The top graph shows change in acidity in micro equivalents H+ per kg in the Greenland icecap. The bottom graph represents the winter temperature records in the eastern United States. From Sigurdsson (1982). The eruption of 2,800 cubic km of magma at Toba caldera 75,000 years ago was the largest eruption in the last 2 million years. The eruption may have release as much as 10E12 kg of sulfuric acid , an order of magnitude more than Laki in 1783 and Tambora in 1815, two of the greatest Holocene eruptions. The Toba eruption may have caused about 3 to 4 degree C cooling at the surface but this impact is hard to detect because of concurrent glacial conditions (Sigurdsson, 1990). Alverez, W. and Asaro, F., 1990, An extraterrestrial impact: Scientific America, v. 256, p. 44-60. American Geophysical Union, 1992, Volcanism and Climate Change, AGU Special Report: Washington DC, American Geophysical Union. Buat-Menard, P., and Arnold, M., 1978, The heavy metal chemistry of atmospheric particulate matter emitted by Mount Etna volcano : Geophysical Research Letters, v. 5, p. 245. Bluth, G.J.S., Rose, W.I., Sprod, I.E., and Krueger, A.J., 1997, Stratospheric loading from explosive volcanic eruptions: Jour. Geology, v. 105, p. 671-683. Bluth, G.J.S., Casadevall, T.J., Schnetzler, C.C., Doiron, S.D., Walter, L.S., Krueger, A.J., and Badruddin, M., 1994, Evaluation of sulfur dioxide emissions from explosive volcanism: the 1982-1983 eruptions of Galunggung, Java, Indonesia: Jour. Volcanol. Geotherm. Res., v. 63, p. 243-256. Bluth, G.J.S., Scott, C.J., Sprod, I.E., Schnetzler, C.C., Krueger, A.J., and Walter, L.S., 1995, Explosive SO2 emissions from the 1992 eruptions of Mount Spurr, Alaska. U.S. Geol. Surv. Bulletin 2139: 37-45. Bluth, G.J.S., Doiron, S.D., Schnetzler, C.C., Krueger, A.J., and Walter, L.S., 1992, Global tracking of the SO2 clouds from the June, 1991 Mount Pinatubo eruptions, Geophys. Res. Lett., v. 19, p. 151-154. Carroll, M.R., and Holloway, J.R., editors, 1994, Volatiles in magmas: Mineralogical Society of America, Reviews in Mineralogy, v. 30, 517 p.
Casadevall, T.J., and Greenland, L.P., 1981, The chemistry of gases emanating from Mount St. Helens, May to September, 1980, in Lipman, P.W. and Mullineaux, D.L., eds., The 1980 eruptions of Mount St. Helens, Washington: U.S. Geological Survey Professional Paper 1250, p. 221-231. Casadevall, T.J., Johnston, D.A., Harris, D.M., Rose, W.I., Malinconcio, L.L., Stoiber, R.E., Bornhorst, T.J., Williams, S.N., Woodruff, Laurel and Thompson, J.M., 1981, SO2 emission rates at Mount St. Helens from March 29 through December, 1980, in Lipman, P.W. and Mullineaux, D.L., eds., The 1980 eruptions of Mount St. Helens, Washington: U.S. Geological Survey Professional Paper 1250, p. 193-200. Casadevall, T.J., Rose, W.I., Gerlach, T.M., Greenland, L.P., Ewert, J., Wunderman, R. and Symonds, R., 1983, Gas emissions and the eruptions of Mount St. Helens through 1982: Science, v. 221, p. 1383-1385. Casadevall, T.J., Doukas, M.P., Neal, C.A., McGimsey, R.G., and Gardner, C.A., 1994, Emission rates of sulfur dioxide and carbon dioxide from Redoubt Volcano, Alaska during the 1989-1990 eruptions: Journal of Volcanology and Geothermal Research, v. 62, p. 519-530. Casadevall, T.J., Stokes, J.B., Greenland, L.P., Mailinconico, L.L., Casadevall, J.R., and Furukawa, B.T., SO2 and CO2 emission rates at Kilauea Volcano, 1979-1984: in Decker, R.W., Wright, T.L., and Stauffer, P.H., (eds. ), Volcanism in Hawaii, U.S. Geological Survey Professional Paper 1350, v. 1, p. 771-780. Courtillot, V.E., 1990, A volcanic eruption: Scientific America, v. 256, p. 44-60. Cradle, R.D., Wartburg, A.F., and Grahek, F.E., 1971, The proportion of sulfate to sulfur dioxide in Kilauea volcano fume: Geochimica et Cosmochemica Acta, v. 35, p. 503-507. Deshler, T., Hofmann, D.J., Johnson, B.J., and Rozier, W.R., 1992, Balloonborne measurements of the Pinatubo aerosol size distribution and volatility at Laramie, Wyoming during the summer of 1991: Geophysical Research letters, v. 19, p. 199-202. Doukas, M.P., 1995, A Compilation of Sulfur Dioxide and Carbon Dioxide Emission-Rate Data from Cook Inlet Volcanoes (Redoubt, Spurr, Iliamna, and Augustine), Alaska During the Period from 1990 to 1994: U.S. Geological Survey Open-File Report 95-55. Finnegan, D.L., Miller, T.L., and Zoller, W.H., 1990, Iridium and other trace-metal enrichments from Hawaiian volcanoes, in Global Catastrophes in Earth History; An Interdisciplinary Conference on Impacts, Volcanism, and Mass Mortality, edited by V.L. Sharpton and P.D. Ward, p. 111-116, Geological Society of America Special Paper 247, Boulder, CO.
Gerlach, T., 1990, Natural Sources of Greenhouse gases: CO2 emissions from volcanoes: Geothermal Resources Council Transactions, vol. 14, part I, pp. 639-641. Gerlach, T.M., and McGee, K.A., 1994, Total sulfur dioxide emissions and pre-eruption vapor-saturated magma at Mount St. Helens, 1980-88: Geophysical Research Letters, v. 21, p. 2833-2836. Gerlach, T.M., Westrich, H.R., Casadevall, T.J., and Finnegin, D.L., 1994, Vapor saturation and accumulation in magmas of the 1989-1990 eruption of Redoubt Volcano, Alaska: Journal of Volcanology and Geothermal Research, v. 62, p. 317-337. Gerlach, T.M., and Taylor, B.E., 1990, Carbon isotope constraints on degassing of carbon dioxide from Kilauea Volcano: Geochimica et Cosmochimica Acta, v. 54, p. 2051-2058. Gerlach, T.M., 1989, Degassing of carbon dioxide from basaltic magma at spreading centers: II. Mid- oceanic ridge basalts: Journal of Volcanology and Geothermal Research, v. 39, p. 221-232. Gerlach, T.M., and Casadevall, T.J., 1986, Fumarole emissions at Mount St. Helens Volcano, June 1980 to October 1981: Degassing of a magma-hydrothermal system: Journal of Volcanology and Geothermal Research, v. 28, p. 141-160. Gerlach, T.M., 1986, Exsolution of H2O, CO2, and S during eruptive episodes at Kilauea Volcano, Hawaii: Journal of Geophysical Research, v. 91, p. 12177-12185. Gerlach, T.M., and Graeber, E.J., 1985, Volatile budget of Kilauea Volcano: Nature, v. 313, p. 273-277. Giggenbach, W.F., 1975, A simple method for the collection and analysis of volcanic gas samples: Bulletin Volcanologique, v. 39, p. 132-145. Graf, H.-F., Kirchner, I., Robock A., and Schult, I., 1993, Pinatubo eruption winter climate effects: model versus observations: Climate Dynamics, v. 9, p. 81-93. Grant, W.B. and others, 1994, Aerosol-Associated Changes in Tropical Stratospheric Ozone Following the Eruption of Mount Pinatubo: Journal of Geophysical Research, v. 99, p. 8197-8211. Greenland, L.P., 1987, Hawaiian eruptive gases: in Decker, R.W., Wright, T.L., and Stauffer, P.H., (eds. ), Volcanism in Hawaii, U.S. Geological Survey Professional Paper 1350, v. 1, p. 759-770. Greenland, L.P., 1987, Composition of gases from the 1984 eruption of Mauna Loa: in Decker, R.W., Wright, T.L., and Stauffer, P.H., (eds. ), Volcanism in Hawaii, U.S. Geological Survey Professional Paper 1350, v. 1, p. 781-790. Hammer, C.U., 1981, Past volcanism and climate revealed by Greenland ice cores: Jour. Volcanology and Geothermal Research, v. 11, p. 3-10. Handler, P., 1989, The effects of volcanic aerosols on global climate: Jour. Volcanology and Geothermal Research, v. 37, p. 233-249. Handler, P., 1984, Possible association of stratospheric aerosols and El Nino type events: Geophys. Res. Lett., v. 11, p. 1121-1124. Hansen, J. E., Lacis, A., Ruedy, R., and Sato, M., 1992: Potential climate impact of Mount Pinatubo eruption: Geophys. Res. Lett., v. 19, p. 215-218. Harris, D.M., Sato, Motoaki, Casadevall, T.J., Rose, W.I. and Bornhorst, T.J., 1981, Emission rates of CO2 from plume measurements, in Lipman, P.W. and Mullineaux, D.L., eds., The 1980 eruptions of Mount St. Helens, Washington: U.S. Geological Survey Professional Paper 1250, p. 201-207. Henderson, P., Inorganic geochemistry: Pergamon, New York, 353 p.
Hilsenrath, E., and others, 1995, Calibaration of the NOAA 11 Solar Backscatter Ultra Violet (SBUV/2) Ozone Data Set from 1989 to 1993 Using Inflight Calibration Data and SSBUV: Journal of Geophysical Research, v. 100, p.1351-1366. Humphreys, W.J., 1913, Volcanic dust and other factors in the production of climatic changes, and their possible relation to ice ages: Bull. Mt. Weather Obs., v. 6, p. 1-34. Ihinger, P.D., Hervig, R.L., McMillan, P.F., 1994, Analytical methods for volatiles in glasses, in Carroll, M.R., and Holloway, J.R., editors, Volatiles in magmas: Mineralogical Society of America, Reviews in Mineralogy, v. 30, p. 66-122. Jaggar, T.A., 1940, Magmatic gases: American Jour. Sci., v. 238, p. 313-353. Johnston, D.A., 1980, Volcanic contribution of chlorine to the stratosphere: more significant to ozone than previously estimated? : Science, v. 209, p. 491-493. TOMS instrument measures ozone and aerosols: Eos Trans. AGU, v. 79: p. 57, 63. Krueger, A.J., 1983, Sighting of El Chichon sulfur dioxide clouds with the Nimbus 7 total ozone mapping spectrometer: Science, v. 220p. 1377-1379. Krueger, A.J., Walter, L.S., Bhartia, P.K., Schnetzler, C.C., Krotkov, N.A., Sprod, I., and Bluth, G.J.S., 1995, Volcanic sulfur dioxide measurements from the Total Ozone Mapping Spectrometer (TOMS) Instruments. Jour. Geophys. Res., 100: 14057 - 14076. Krueger, A.J., Doiron, S.D., Bluth, G.S.J., Walter, L.S., and Schnetzler, C.C., 1994, Volcanic hazard detection with the Total Ozone Mapping Spectrometer (TOMS): U.S. Geol. Surv. Bulletin 2047, p. 367-372. Krueger, A.J., Walter, L.S., Schnetzler, C.C., and Doiron, S.D. 1990, TOMS measurement of the sulfur dioxide emitted during the 1985 Nevado del Ruiz eruptions: Jour. Volcanol. Geotherm. Res., v. 41, p. 7-15. Kyle, P.R., Meeker, K., and Finnegan, D., 1990. Emission rates sulfur dioxide, trace gases and metals from Mount Erebus, Antarctica. Geophys. Res. Let., 17, 2125- 2128. Kyle, P.R., Sybeldon, L.M., McIntosh, W.C., Meeker, K., and Symonds, R.B., 1994, Sulfur dioxide emission rates from Mount Erebus, Antarctica, in Kyle, P.R., ed., Volcanological and Environmental Studies of Mount Erebus, Antarctica: Antarctic Research Series, v. 66, p. 69-82. Labitzke, K., and McCormick, M.P., 1992, Stratospheric temperature increases due to Pinatubo aerosols: Geophys. Res. Lett., v. 19, p. 207-210. Lacis, A. A., Hansen, J. E., and Sato, M., 1992: Climate forcing by stratospheric aerosols: Geophys. Res. Lett., v. 19, p. 1607-1610. Lamb, H.H., 1970, Volcanic dust in the atmosphere; with a chronology and assessment of its meteorological significance: Phil. Trans. Roy. Soc. Lond., A266, 425-533. Lough, J.M., and Fritts, H.C., 1987, An assessment of the possible effects of volcanic eruptions on North American climate using tree-ring data, AD 1602-1900: Climatic Change, v. 10, p. 219-239. Luria, M., Boatman, J.F., Harris, J., Ray, J., Straube, T., Chin, J., Gunter, R.L., Herbert, G., Gerlach, T.M., and Van Valin, C.C., 1992, Atmospheric Sulfur Dioxide at Mauna Loa, Hawaii: Journal of Geophysical Research, v. 97, p. 6011-6022. Malinconico, L.L., 1979, Fluctuations in SO2 emission during recent eruptions of Etna: Nature, v. 278, p. 43-45. Mankin, W.G., and Coffey, M.T., 1984, Increased stratospheric hydrogen chloride in the El Chichon cloud: Science, v. 226, p. 170-172. Mathez, E.A., 1976, Sulfur solubility and magmatic sulfides in submarine basaltic glass: Journal of Geophysical Research, v. 81, p. 4,269-4,276. McCormick, M.P., 1992, Initial assessment of the stratospheric and climatic impact of the 1991 Mount Pinatubo eruption: Prologue: in a special section of Geophysical Research letters, v. 19, p. 149. McGee, K.A., 1992, The structure, dynamics, and chemical composition of noneruptive plumes from Mount St. Helens, 1980-88: Journal of Volcanology and Geothermal Research, v. 51, p. 269-282. McGee, K.A. and Casadevall, T.J., 1994, A compilation of sulfur dioxide and carbon dioxide emission-rate data from Mount St. Helens during 1980-88: U.S. Geological Survey Open-File Report No. 94-212, 24 p.
McGee, K.A. and Sutton, A.J., 1994, Eruptive activity at Mount St. Helens, Washington, USA, 1984-1988: a gas geochemistry perspective: Bulletin of Volcanology, v. 56, no. 6-7, p. 435-446. McGee, K.A., Sutton, A.J. and Sato, Motoaki, 1987, Use of satellite telemetry for monitoring active volcanoes, with a case study of a gas-emission event at Kilauea Volcano, December 1982, in Decker, R.W., Wright, T.L. and Stauffer, P.H., eds., Volcanism in Hawaii: U.S. Geological Survey Professional Paper 1350, p. 821-825. Meeker, K., Chuan, R., Kyle, P.R., Palais, J., 1991. Emission of elemental gold particles from Mount Erebus, Ross Island, Antarctica. Geophys. Res. Lett. 18, 1405-1408. Moore, J.G., 1970, Water content of basalt erupted on the ocean floor: Contr. Miner. Pet., v. 28, p. 272-279. Moore, J.G., and Fabbi, B.P., 1971, An estimate of the juvenile sulfur content of basalt: Contr. Miner. Pet., v. 33, p. 118-127. Moore, J.G., and Schilling, J.G., 1973, vesicles, water, and sulfur in Reykjanes Ridge basalts: Contr. Miner. Pet., v. 41, p. 105-118. Mossop, S.C., 1964, Volcanic dust collected at an altitude of 20 km: Nature, v. 203, p. 824-827. Naughton, J.J., Finlayson, J.B., and Lewis, V.A., 1975, Some results from recent chemical studies at Kilauea Volcano, Hawaii: Bulletin Volcanologique, v. 39, p. 64-69. Naughton, J.J., Lewis, V.A., and Thomas, D.M., 1975, Fume compositions found at various stages of activity at Kilauea Volcano, Hawaii: Journal of Geophysical Research, v. 80, p. 2963-2966. Professional Paper 1250, p. 251-254. Noguchi, K. and Kamiya, H., 1963, Prediction of volcanic eruption by measuring the chemical composition and amount of gases: Bulletin Volcanologique, v. 26, p. 367-378. Officer, C.B., Hallam, A., Drake, C.L., and Devine, J.D., 1987, Late Cretaceous and paroxysmal Cretaceous/Tertiary extinctions: Nature, v. 326, p. 143-148. Palais, J.M., and Sigurdsson, H., 1989, Petrologic evidence of volatile emissions from major historic and pre-historic volcanic eruptions: American geophysical Union Geophysical Monograph Series 52, p. 31-56. Pinto, J.P., Turco, R.P., and Toon, O.B., 1989, Self-limiting physical and chemical effects in volcanic eruption clouds: Jour. Geophys. Res., v. 94, p. 11,165-11,174. Prather, M., 1992, Catastrophic loss of stratospheric ozone in dense volcanic clouds: Jour. Geophys. Res., v. 97, p. 10,187-10,191. Prather, M., McElroy, M.B., and Wolfsy, S.C., 1984, Reductions in ozone at high concentrations of stratospheric halogens: Nature, v. 312, p. 227-231. Quiroz, R. S., 1983, The isolation of stratospheric temperature change due to the El Chichón volcanic eruption from nonvolcanic signals: J. Geophys. Res., v. 88, p. 6773\2556780. Rampino, M.R., and S. Self, 1993, Climate-Volcanism Feedback and the Toba Eruption of ~74,000 Years Ago: Quaternary Research, v. 40, p. 269-280. Rampino, M.R., S. Self, and Strothers, R.B., 1988, Volcanic Winters: Ann. Rev. Earth Planet. Sci., v. 16, p. 73-99. Rampino, M.R., and Self, S., 1984, The atmospheric effects of El Chichon: Scientific American, v. 250, 48-57. Rampino, M.R., and Self, S., 1982, Historic eruptions of Tambora (1815) Krakatau (1883) and Agung (1963), their stratospheric aerosols and climatic impact: Quaternary Research, v. 18, p. 127-143. Rampino, M.R., Self, S., and Fairbridge, R.W., 1979, Can rapid climatic change cause volcanic eruptions? : Science, v. 206, p. 826-829. Renne, P.R., and Basu, A.R., 1991, Rapid eruption of the Siberian Traps flood basalts at the Permo-Triassic boundary: Science, v. 253, p. 176-179. Robock, A., Taylor, K.E., Stenchikov, G.L., and Liu, Y., 1995, GCM evaluation of a mechanism for El Niño triggering by the El Chichón ash cloud: Geophys. Res. Lett., v. 22, p. 2369-2372. Robock, A. and Free, M.P., 1995, Ice cores as an index of global volcanism from 1850 to the present: J. Geophys. Res., v. 100, p. 11,549-11,567. Robock, A., and Mao, J., 1992: Winter warming from large volcanic eruptions: Geophys. Res. Lett., v. 19, p. 2405-2408. Robock, A., 1991, The volcanic contribution to climate change of the past 100 years. in Greenhouse-Gas-Induced Climatic Change: A Critical Appraisal of Simulations and Observations, M. E. Schlesinger, Ed., (Elsevier, Amsterdam), 429-444. Robock, A., 1981, A latitudinally dependent volcanic dust veil index, and its effect on climate simulations: J. Volcanol. Geotherm. Res., v. 11, p. 67-80. Robock, A., 1981, The Mount St. Helens volcanic eruption of 18 May 1980: minimal climatic effect: Science, v. 212, p.1383-1384. Robock, A., and Mass, C., 1982, The Mount St. Helens volcanic eruption of 18 May 1980: large short-term surface temperature effects: Science, v. 216, p. 628-630. Rose, W.I., Jr., 1977, Scavenging of volcanic aerosol by ash - Atmospheric and volcanologic implications: Geology, v. 5, p. 621-624. Rose, W.I., Jr., Bonis, S., Stoiber, R.E., Keller, M., and Bickford, T., 1973, Studies of volcanic ash from two recent Central American eruptions: Bulletin Volcanologique, v. 37, p. 338-364. Rose, W.I., Heiken, G., Wohletz, K., Eppler, D., Barr, S., Miller, T., Chuan, R.L., and Symonds, R.B., 1988, Direct rate measurements of eruption plumes at Augustine volcano: A problem of scaling and uncontrolled variables: Journal of Geophysical Research, v. 93, no. B 5, p. 4485-4499. Schaefer, S.J., Kerr, J.B., Millan, M.M., Realmuto, V.J., Krueger, A.J., Krotkov, N.A., Seftor, C., and Sprod, I.E., 1997, Geophysicists unite to validate volcanic SO2 measurements: Eos Trans. AGU, v. 78, p. 217 and 223. Schnetzler, C.C., Bluth, G.J.S., Krueger, A.J., and Walter, L.S., 1997, A proposed volcanic sulfur dioxide index (VSI): Journal of Geophysical Research., v. 102, p. 20087-20092. Schnetzler, C.C., Doiron, S.D.,Walter, L.S., and Krueger, A.J., 1994, Satellite measurements of sulfur dioxide from the Redoubt eruptions of 1989-1990: Jour. Volcanol. Geotherm. Res., v. 62, p. 353-357. Seftor, C.J., Hsu, N.C., Herman, J.R., Bhartia, P.K., Torres, O., Rose, W.I., Schneider, D.J., and Krotkov, N., 1997, Detection of volcanic ash clouds from Nimbus-7/TOMS reflectivity data, Journal of Geophysical Research, v. 102, p. 16749-16759. Self, S., Thordarson, T., and Keszthelyi, L., 1997, Emplacement of continental flood basalt lava flows, in Mahoney, J.L., and Coffin, M.F., Large Igneous Provinces: Continental, Oceanic, and Planetary Flood Volcanism: Geophysical Monograph 100, American geophysical Union, p. 381-410. Self, S., Zhao, J-X, Holasek, R.E., Torres, R.C., King, A.J., 1996, The atmospheric impact of the Mount Pinatubo eruption in: Newhall, C.G., Punongbayan, R.S. (eds.) Fire and mud: Eruptions and lahars of Mt. Pinatubo, Philippines, Philippine Institute of Volcanology and Seismology, Quezon City and University of Washington Press, Seattle, 1126 p.
Self, S., Rampino, M.R., and Barbera, J.J., 1981, The possible effects of large 19th and 20th century volcanic eruptions on zonal and hemispheric surface temperatures: Jour. Volcanology and Geothermal Research, v. 11, p. 41-60. Shannon, J.M. and Bluth, G.J.S., 1994, Volcanic cloud dispersion: a study of SO2 emissions from the 1980 eruptions of Mount St. Helens, EOS Trans. AGU, 1994 Fall Meeting, p. 716. Shaw, H.R., and Moore, J.G., 1988, Magmatic heat and the El Nino cycle: Eos, v. 69, p. 1553 and 1564. Shepherd, E.S., 1925, The analysis of gases obtained from volcanoes and from rocks: Jour. Geol. V. 33, p. 289-370. Sheridan, P.J., Schnell, R.C., Hofmann, D.J., and Deshler, T., 1992, Electron microscope studies of Mt. Pinatubo aerosol layers over Laramie, Wyoming during the summer of 1991: Geophysical Research letters, v. 19, p. 203-206. Siegel, B.Z., and Siegel, S.M., 1987, Hawaiian volcanoes and the biogeology of mercury: in Decker, R.W., Wright, T.L., and Stauffer, P.H., (eds. ), Volcanism in Hawaii, U.S. Geological Survey Professional Paper 1350, v. 1, p. 827-839. Sigurdsson, H., Volcanic pollution and climate: the 1783 Laki eruption. Eos, v. 63, p. 601-602. Sigurdsson, H., 1990, Assessment of the atmospheric impact of volcanic eruptions, in Global Catastrophes in Earth History; An Interdisciplinary Conference on Impacts, Volcanism, and Mass Mortality, edited by V.L. Sharpton and P.D. Ward, p. 99-110, Geological Society of America Special Paper 247, Boulder, CO.
Ozone Depletion at Northern Mid-Latitudes: Journal of Geophysical Research. Stoiber, R.E., Malinconico, L.L. and Williams, S.N., 1983, Use of the correlation spectrometer at volcanoes, in Tazieff, H. and Sabroux, J.C., eds., Forcasting Volcanic Events: Amsterdam, Elsevier, p. 425-444. Stommel, H., and Stommel, H., 1983, Volcano Weather, Seven Seas, Newport Rhode Island. Strothers, R.B., 1984, Mystery cloud of AD 536: Nature, v. 307, p. 344-345. Stowe, L.L., Carey, R.M., and Pellegrino, P.P., 1992, Monitoring the Mt. Pinatubo aerosol layer with NOAA/11 AVHRR data: Geophys. Res. Lett., v. 19, p. 159-162. 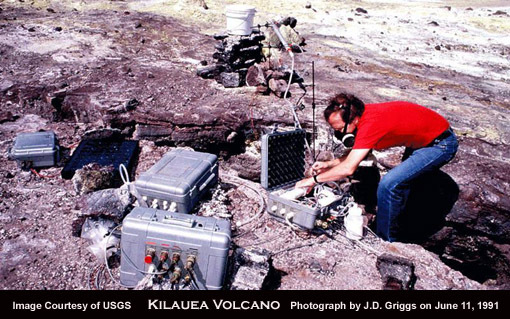 Sutton, A.J., 1992, A prototype system for continuous on-site chemical monitoring of volcanic gas and condensate with field testing at Kilauea, Hawaii: U.S. Geological Survey Open-File Report No. 92-678, 169 p.
Sutton, A.J., and Elias, T., 1993, Volcanic gases create air pollution on the Island of Hawai'i: Earthquakes and Volcanoes, v. 24, no. 4, p. 178-196. 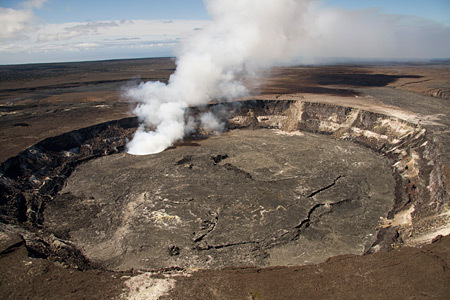 Sutton, A.J., and Elias, T., 1993, Annotated bibliography of volcanic emissions and their effect on ambient air character at Kilauea, Hawaii: U.S. Geological Survey Open-File Report No. 93-551e, 26 p.
Sutton, A.J., Elias, T., Navarette, R., 1994, Volcanic gas emissions and their effects on ambient air character at Kilauea Volcano, Hawaii: U.S. Geological Survey Open-File Report No. 94-569, 51 p.
Sutton, A.J., McGee, K.A., Casadevall, T.J. and Stokes, J.B., 1992, Fundamental volcanic-gas-study techniques: an integrated approach to monitoring, in Ewert, J.W. and Swanson, D.A., eds., Monitoring volcanoes: techniques and strategies used by the staff of the Cascades Volcano Observatory, 1980-90: U.S. Geological Survey Bulletin 1966, p. 181-188. Symonds, R.B., Rose, W.I., Bluth, G.J.S., and Gerlach, T.M., 1994, Volcanic-gas studies: methods, results, and applications, in Carroll, M.R. and Holloway, J.R., eds.,Volatiles in Magmas: Reviews in Mineralogy, v. 30, 1-66. Symonds, R.B., Reed, M.H., and Rose, W.I., 1992, Origin, speciation, and fluxes of trace-element gases at Augustine volcano, Alaska: insights into magma degassing and fumarolic processes: Geochimica et Cosmochimica Acta, v. 56, p. 633-657. Symonds, R.B., Rose, W.I., Gerlach, T.M., Briggs, P.H., and Harmon, R.S., 1990, Evaluation of gases, condensates, and SO2 emissions from Augustine volcano, Alaska: the degassing of a Cl-rich volcanic system: Bulletin of Volcanology, v. 52, p. 355-374. Symonds, R.B., Rose, W.I., and Reed, M.H., 1988, Contribution of Cl- and F-bearing gases to the atmosphere by volcanoes: Nature, v. 334, p. 415-418. Symonds, R.B., Rose, W.I., Reed, M.H., Lichte, F.E., and Finnegan, D.L., 1987, Volatilization, transport and sublimation of metallic and non-metallic elements in high temperature gases at Merapi Volcano, Indonesia: Geochimica et Cosmochimica Acta, v. 5 1, p. 2083-2101. Taylor, P.S., and Stoiber, R.E., 1973, Soluble material on ash from Central American volcanoes: Geological Society of America Bulletin: v. 84, p. 1031-1042. Thorarinsson, S., 1979, On the damage caused by volcanic eruptions, with special reference to tephra and gases, in Volcanic activity and human ecology, (eds P.D. Sheets and D.K., Grayson), Academic press, London, p. 125-160. Thordarsson, Th, Self, S., Oskarson, N., and Hulsebosch, T., 1996, Sulfur, chlorine, and fluorine degassing and atmospheric loading by the 1783-1784 Laki (Skaftar Fires) eruption in Iceland: Bull. Volcanol. Thordarsson, Th, Self, S., Larson, G., and Steinthorsson, S., 1987, Eruption sequence of the Skaftar Fires 1783-1785, Iceland: Eos, v. 68, p. 1550. Wallace, P.J., and Gerlach, T.M., 1994, Magmatic vapor source for sulfur dioxide released during volcanic eruptions: Evidence from Mount Pinatubo: Science, v. 265, p. 497-499. Westrich, H.R., and Gerlach, T.M., 1992, Magmatic gas source for the stratospheric SO2 cloud from the June 15, 1991 eruption of Mount Pinatubo: Geology, v. 20, p. 867-870. Wexler, H., 1952, Volcanoes and world climate: Scientific American, April, p. 3-5. White, D.E., and Waring, G.A., 1963, Data of geochemistry, Sixth Edition, Chapter K. Volcanic emanations: U.S. Geol. Survey Prof. Paper 440-K, 29 pp. Wood, C.A., 1992, Climatic effects if the 1783 Laki eruption in Harington, C.R., ed., The Year Without a Summer? World Climate in 1816: Canadian Museum of Nature, Ottawa, p. 58- 77. Wood, C.A., 1984, Amazing and portentous summer of 1783: Eos, v. 65, p. 409. Zreda-Gostynska, G., Kyle, P.R., Finnegan, D. 1993. Chlorine, fluorine, and sulfur emissions from Mount Erebus, Antarctica and estimated contributions to the Antarctic atmosphere: Geophysical Research Letters, v. 20, p. 1959-1962. Volcanic Gases Provide Clues to How Volcanoes Work from the Hawaiian Volcano Observatory's VolcanoWatch. Effects of Volcanic Gases by Richard V. Fisher. Volcanic Gases in A Basic Guide to Volcanic Hazards by Colleen M. Riley.